Happy Friday! As we head into the weekend, we see Bitcoin hovering around $3300 across top exchanges. The bears were firmly in control this week, plunging Bitcoin to 15-month lows by mid-day Friday. Meanwhile, Ethereum fared no better this tumultuous week, trading around $85 across exchanges on Friday. As the end of the year approaches, bullish predictions for a healthy year-close seem increasingly misplaced. Will cryptomarkets attain a respite this weekend from the broader sell-off? 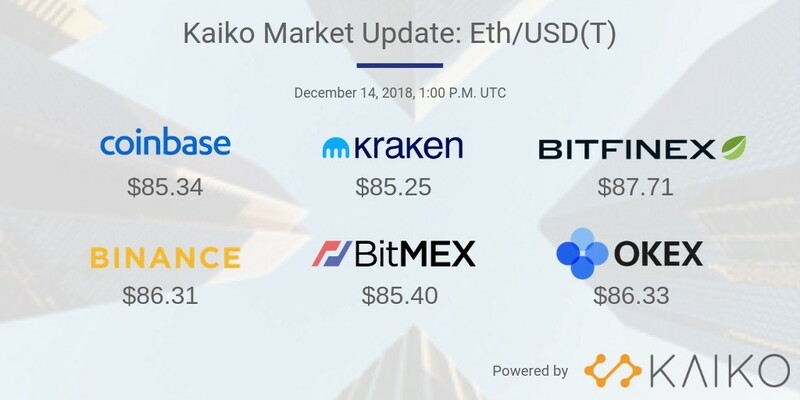 *Data collected using Kaiko’s Market Data API through the Volume Weighted Average Price endpoint. Read our full documentation here.